Microsoft resolved the problem with Skype messenger. These are the most frequent issues people descibe. The first reports of problems with the app began around 11:00 GMT. The Redmond firm says instant messages and Skype for Web are working fine and it is hard at work to restore the rest of the service. Earlier this morning, Skype published a statement on its website: “We have detected an issue that is affecting Skype in a number of ways. “If you’re signed in to Skype, you will not be able to change your status and your contacts will all show as offline even if they are online. “As a result, you won’t be able to start Skype calls to them. “A small number of messages to group chats are not being delivered, but in most cases you can still instant message your contacts. “If you aren’t signed in to Skype, you may be experiencing difficulty when attempting to sign in. “Any changes to your Skype account such as your Credit balance or your profile details might take a little while to be displayed. “You may also have difficulty loading web pages on the Skype Community. For that reason, please check back here for future updates. “We’re doing everything we can to fix this issue and hope to have another update for you soon. 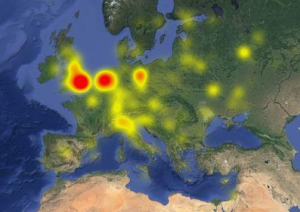 Status aggregator Down Detector claims almost half of all reported issues with Skype are from users having trouble logging into the service. Meanwhile, video and voice calls account for some 28 per cent and the ability to send and receive message account for 27 per cent. According to Google trends – Pakistan is the top country where people looking how to unblock sites. Like in many others Muslim countries in the Middle East a big number of sites are blocked in Pakistan. Among them we can list Youtube, Facebook, Flickr, Twitter, Wikipedia and others. So what are the best solutions for this problem? Without any doubts vpn is the most reliable solution. VPN is a virtual private network. This is a strong technology that lets to mask your IP address, making you secure and anonymous in the Internet. Besides that vpn encrypts all your traffic. So nobody can review and monitor your on-line activity. Find out more about vpn. Under the VPN you can open site you like and stay safe and secure. Is is safe to use VPN in Pakistan? VPN technology is used by many companies for security reasons. It is not prohibited in Pakistan. Of course, if you are going to do some cyber crimes using vpn – it is better to STOP! VPN solutions are much more reliable than Proxy. It is anonymous and secure way to surf in Pakistan. Proxy does not provide you full anonymity in contradistinction to VPN. Read our article Proxy vs VPN – why VPN is more reliable. You can use vpn on any device like iPhone, iPad, Android smartphones and planshets, Mac, Windows PC and any other that supports vpn technology. Also you do not need any additional software to use vpn because this technology is present in Windows, iOS, Android and Mac. Here you can find out others instructions to how setup VPN in others systems. Now Sahrzad provides free trial vpn accounts for test. Don’t miss your chance to get the best solution for on-line privacy and anonymity. Security Risks in Mobile Networks: is VPN a solution? Without a doubt, the use of mobile networks is here to say. In fact, the design of mobile phones continues to get better as mobile phone manufacturers invest a lot just to be ahead in the competition. But whether we like it or not, there are a lot of security risks while you are enjoying the advantages of this latest communication technology. So far, the biggest security risk in mobile networks is loss of privacy and stealing of personal information, especially when you are browsing the Internet in a public Wi-Fi zone. No matter how secure your operating software is, you are still not totally safe. Smartphones may have security features against robbers, but not against hackers and online thieves. To give you a better idea, imagine exposing yourself in a crowd of total strangers such as train station or coffee shop. Once you visit a website or make an online transaction, it’s like telling them all your personal details. As compared to using broadband network, your data via Wi-Fi is being transferred via wireless connection. Everyone is using the same network. The problem arises when a third party tries to intercept your data. And because the network system is not capable of detecting interceptors, your online activities are exposed. As an additional problem, you and everyone in that area don’t have any idea that your data can be stolen. This is why you should use a VPN (Virtual Private Network). As the name suggests, VPN allows users to use a public network privately. It hides your real IP address by assigning a temporary IP address while you are using the network. But unlike other ways to browse the web anonymously, VPN traffic is highly encrypted. This means that no third party can easily intercept your data and you are now secured. In case you are not yet aware, many business owners use VPN to protect their vital information. They allow their employees to access their data while working in remote areas using Wi-Fi. But if you also plan to use VPN, you should know which type of VPN is applicable for your needs. You don’t want to spend money for something you will not use. And although you can use a free VPN, don’t expect the same quality of service you can get from the premium ones. First of all, free VPNs also need money to maintain their service and they get it via advertisements while you are using their service. You should not also expect a free VPN to have a stable and fast connection, as well as great customer service.